It happens a lot that our clients glance at the full list of reports available in MetricsCube and cannot help but ask how and why there are so many of them. And every single time we are only too eager to emphasize the connection between the multi-surfaced nature of web hosting companies and the need for a detailed understanding of each of those layers individually. Through the rich variety of variables that MetricsCube allows you to keep monitoring on a regular basis (be that customers, services, or domains), we hope to help you see your business priorities in a better light, and take data-influenced decisions with greater confidence. Today’s update that we have the immense honor of presenting is centered around a completely new business report that is the lifeblood of each web hosting enterprise relying on the WHMCS system, and yet is still impossible to access anywhere outside MetricsCube. Retention – The most frequently asked-for report now in MetricsCube! You have probably wondered many times what is so special about brands like Starbucks that people all over the world would kill for a sip of their coffee while other, smaller players on the market are forced to wrap up their business before even throwing their first anniversary party. It all eventually comes down to the metric known as retention, and more specifically – to realizing when your first customers begin to churn or when the number of renewed services begins to drop, so that you could take a series of necessary steps and turn the tide before it is too late. For maximally convenient evaluation of your company’s performance, you will be empowered not only to select a single field you currently wish to focus on, but choose the preferred interval in which the data shall be displayed as well (year or month mode). If there is one thing we can all agree on, it is probably the fact that no one likes to wait. Especially when you are a tiny bit away from looking at your entire network of business operations from an entirely different, yet unknown point of view. 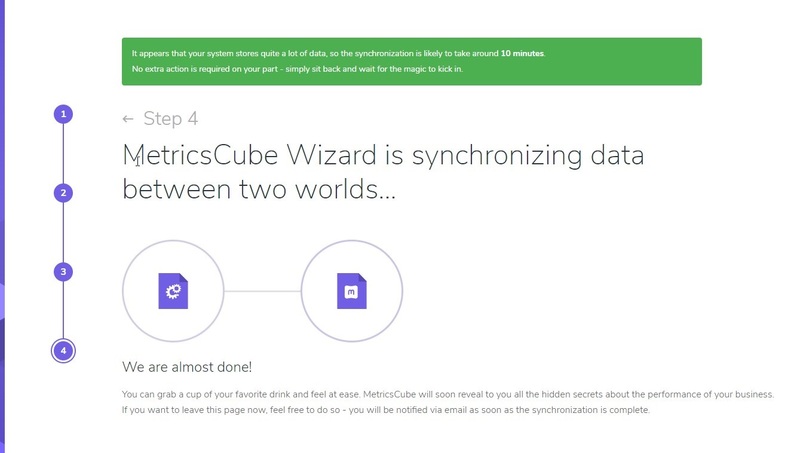 In order to ensure that the connection process between MetricsCube and your WHMCS proceeds as smoothly as possible, we introduced a very practical system notifying on estimated time remaining until the end of the synchronization whenever a substantial amount of data is being fetched. This way, you will not have to stand by and wait in anticipation for the integration to be over, but grab yourself a delicious cup of coffee, or make that important phone call that you always put off for later. Given another report added extra to the already sizable arsenal, it would be perfectly natural of you to question whether this powerful load of statistics will not have a negative influence on the performance of the application. You may put your mind at ease though because we have managed not only to avoid those unwanted side effects entirely, but even speed up the execution of certain tasks altogether by getting rid of redundant libraries and compressing the JS files on the website to the maximum. While budging retention up even an inch may initially seem like a daunting task, it was proven that those endeavors are certainly worth every effort. As the study conducted by Bain & Company, in coordination with Earl Sasser of the Harvard Business School points out, increasing your retention rate by merely 5% can magnify your profits by even 25%-95%. And how to best focus on refining your business strategies to reach that desirable threshold of 5% if not with MetricsCube? Sign up for a 14-day free trial of our cutting-edge tool and make your move before any one else does!